As an editor and indexer, I often deal with texts that use diacritics to transcribe Arabic. In parts 1 through 4 of this series (Romanized Arabic in English Texts, Part 1 — Sources of Variations; Romanized Arabic in English Texts, Part 2 — Other Challenges for Editors; Romanized Arabic in English Texts, Part 3 — Spelling the Definite Article; Romanized Arabic in English Texts, Part 4 — Omitting, Capitalizing, and Alphabetizing the Definite Article), I often mention the use of special characters, but until now, I have not explained how to put them in your Word document. 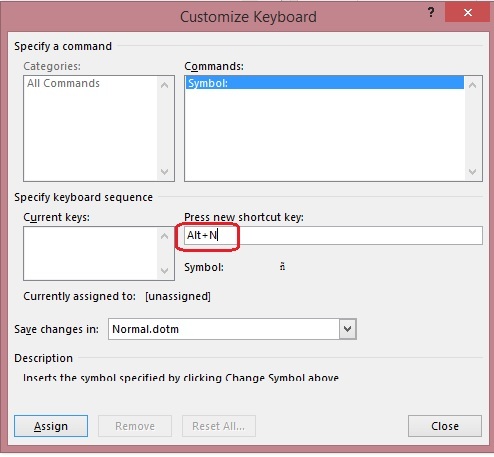 In this part, I discuss how to insert symbols and create keyboard shortcuts. In part 6, I discuss how to use AutoCorrect and FRedit for special characters. If you only need to insert a few special characters in a Word document, you can use this method. Go to the Insert tab and click on Symbol. You will bring up a box with up to 20 of the most recently inserted symbols. If what you want is not there, click on More Symbols at the bottom. Another window will pop up. (You can click and drag on the little triangle at the bottom to enlarge it if you want.) Choose the font and subset that you want. Find and click on the character you want in the table. Click on Insert, then Close. The next time you open the Symbols menu, that character will appear in the box that opens first, so you don’t have to search for it again. 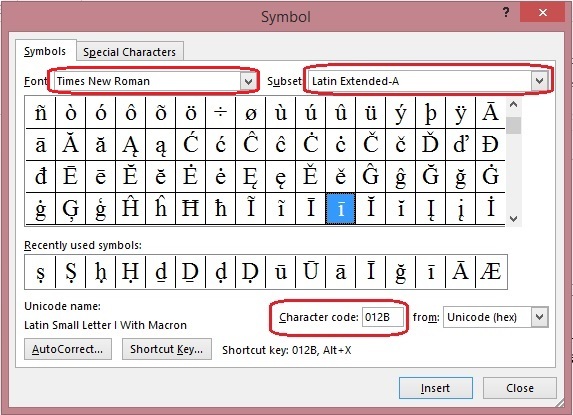 Note that not all characters are available in all fonts, but the most common ones should be available in popular fonts. Your publisher might require you to use a particular font or even provide one for you to download and use. For Arabic, in Times New Roman, I find the letters with macrons under Latin Extended A; the letters with dots are under Latin Extended Additional. Under the table of letters, on the right, you will see the character code (circled in red in the screen shot). I have selected the Unicode (hex) code from the drop-down list to the right of that, since most publishers require Unicode characters. If your publisher has provided you with a list of Unicode characters to use, check that the code for the character you have selected from the table matches the one from your publisher, since some characters look similar but are different. The method above is fine if you only have to use it a few times, but if you have to do this many times, you will want another method. You can create keyboard shortcuts (discussed below) if you only have a few different characters to insert, but if you have to use many different characters in a text (as I do with Arabic), use AutoCorrect or the FRedit macro (discussed in part 6). Go to the Insert tab and the Symbols menu. Find and select the character you want, but instead of clicking on Insert, click on Shortcut Key at the bottom left. A new window pops up. Type in the shortcut you want — usually Alt + something or Alt + Shift + something. Word will warn you if the key combination is already assigned to something else, in which case you can override (not a good idea if it’s a function) or choose another key combination. Note that the lowercase and uppercase versions of the same character have different character codes, so if you need both versions, you will have to repeat these steps and use a different key combination for each. I have created shortcuts for characters that I use frequently: Alt + A for Æ [00C6] (the first letter in my name) and Alt + V for P (a check mark in Wingdings 2). As I said, this method is OK if you need only a few special characters, but if you need many, such as I do for transcribing Arabic, you will run out of possible key combinations. Instead, use AutoCorrect or the FRedit macro, which I discuss in part 6. There are two kinds of writer’s block. The one most of us are familiar with is when you have trouble starting to write something, whether it’s an assignment or just for yourself. You sit in front of the screen (or at the typewriter, or with your pen and pad; some of us still like the old-style writing implements) and nothing happens. If you write nonfiction, you have interview notes and background material, but you can’t put them together. If you write fiction, your imagination has fled, your ideas have dried up, your characters are flat and stale. Nothing flows. It’s terrifying. A block can be caused by fear of rejection, feeling intimidated by a prestigious assignment, and any number of other emotional issues. Plenty has been written about overcoming writer’s block. Most suggestions involve stepping away from the project. I don’t avoid writing if I get blocked, though. I’ve been lucky to rarely experience true writer’s block. I might procrastinate on starting to write something, but that’s a little different from actually being blocked. The few (thankfully) times I’ve had to cope with traditional writer’s block, the easiest way to break free has been to write a letter, usually to my mother. Even after I moved back to my hometown and there was no need to write letters any longer because she was either across town or right downstairs, and even since she died, I would write letters to her if I couldn’t get started on a writing assignment. There’s something about writing to someone who will be completely accepting and uncritical that frees up my mind and my muse. After a couple of paragraphs, I’m ready to plunge back into my current assignment and get it done. The writer’s block that is less well-known and less-discussed is one against revision — the inability to rewrite something you’ve actually managed to write. Not so much for yourself, but for an assigning editor or client. I’m lucky again that I’m not often asked to do any major revisions on what I write, but it does happen on occasion, and I hate it. Once I’ve done my interviewing and research, crafted a draft, edited myself, proofread the result, and sent off the article, I’m done. It’s out of my head and heart. I’m eager to see it in print or online, but I don’t want to revisit it (unless I have ideas for repurposing it somehow). Being asked to revise is frustrating at best and feels impossible at worst. Several years ago, I pitched an article to a magazine for writers that I would love, love, love to be published in. I did something I rarely do: wrote the story and sent it on spec (that is, on speculation — without a contract or agreement, in the hopes it would be accepted; more about that in a future essay). They liked it, but asked for extensive revisions. It’s been sitting in a folder ever since. I was and still am totally stuck; I just can’t wrap my brain around what they want. The problem probably is that the revision request isn’t specific enough for me to respond to it. I can answer actual questions, but taking a whole new approach to the subject seems to have jammed my gears completely. Every once in awhile, I take out that typewritten manuscript (that should tell you how long ago this happened) and think about re-crafting it for re-submission. I’m not sure if I could even reach the person who was the subject of the article; he might not be alive any longer. The editor who responded to the original submission is no longer at the magazine, which might actually work in my favor; the current editor might like the unrevised version! But the thought of that unfinished, and thus unpublished, piece is like the irritant in the oyster, and I want it to evolve into that bright, beautiful pearl. It’s quite possible that just writing about how difficult it can be to revise what I thought was a finished work might do the trick and help me find a way into a new version of this article. One approach might be to go back to my original notes and start as if I hadn’t written the first version at all. One can hope. Writer’s block, obviously, applies to writers — but editors get blocked, too. A very dry or complex manuscript, a first project for a prestigious client, a huge manuscript that takes longer than expected, the need to learn a client’s wacky house style … an editor can get stuck and feel unable to keep going with a demanding project. Even an enjoyable project can push an editor into a work blockage if it collides with something less-interesting to work on, requires using a different style from your usual one, or arrives when you’re struggling with health or personal issues. Traditional approaches to writer’s block can work for blocked editors. Step away from the computer and your desk or home office, and go out for a walk. Treat yourself to a meal or movie with a friend or family member. Post to a friend’s or colleague’s blog. Spend an hour or two on a craft project. Envision how good it will feel to get it done — or how you will spend the fee. Write a letter to someone. Switch to another project for a while. If the deadline isn’t imminent, give yourself a couple of days or the weekend off. Just as I was writing the first draft of this post, I got a message from Writer’s Digest magazine with a mention of what might be a useful resource for anyone else stuck in this situation: Write and Revise for Publication by Jack Smith. I just might get a copy and see if it can help. In the meantime, I might take another look at that folder. The subject’s organization doesn’t seem to exist any longer, but maybe I can revise that story and get it out to the world — an updated version might look good to another market entirely. Have you been blocked on a project? If so, how did you get yourself jump-started so you could finish it up? Ruth E. Thaler-Carter (www.writerruth.com) is the editor-in-chief of An American Editor and an award-winning provider of editorial and publishing services for publications, independent authors, publishers, associations, not-for-profits, and companies worldwide. She also hosts the annual Communication Central “Be a Better Freelancer”® conference for colleagues. Ruth can be contacted at Ruth.Thaler-Carter@AnAmericanEditor.com. In a similar vein to my recent post about networking etiquette (On the Basics: Making the Best Use of Interaction with Colleagues), someone in a Facebook group recently asked for help in finding projects that would generate $250 “by Saturday.” That kind of plea might not violate the rules of good manners or effective networking, but it can damage an editorial freelancer’s image and reputation just as much as bogarting into a community of colleagues with a demand for their contacts and referrals before establishing credibility and connection with that group. Most of us have had financial issues at some point in our freelance editorial lives — I certainly have. It can be quite frightening to need funds urgently, and asking for work leads is better than asking people you don’t know for money, but finding a new client and project that will generate a substantial fee in less than a week is unlikely. Some do pay almost as soon as they receive an invoice (usually via PayPal), but that seems to be a rarity. The standard in the business world is payment within 30 days of invoice date, and some clients are now using 45 and even 60 days as their payment schedules. We have to be prepared to wait for payment sometimes. The impracticality of such a “need a fast-paying project now” request aside, it isn’t good for the asker’s image. It implies that the poster can’t manage their business effectively enough to head off financial issues, and doesn’t have personal resources — savings, family, credit cards, things to sell — to offset a crisis. Colleagues may be sympathetic when we experience business or personal financial issues, but might change their perception of someone who puts that out into a wide-open arena like Facebook. And clients don’t want to know. Even clients we’ve gotten to be friendly with prefer to see us as financially sound and responsible. Here are some thoughts about protecting yourself from an urgent need for a couple hundred bucks in a couple of days, and from other financial issues that can arise. For those who are starting your editorial businesses, try to have a cushion of savings in place before you launch. You probably won’t make a lot of money right away, and you don’t want to start out feeling desperate for funds. Desperation shows, and pushes us into making bad decisions about accepting projects that don’t pay what we’re worth. Having at least a couple months’ worth of expenses covered by a savings cushion will help you feel more secure and protect you against a crisis. Once you have a savings account in place, use it! Not by spending what’s in it, but by “paying yourself” regularly. With every incoming payment, put a portion in your savings account for emergencies (and another portion in your business account for paying estimated taxes). Be sure to set up ways for clients to pay you as quickly as possible, such as a PayPal account, so you don’t always have to wait to receive a check, get it to your bank, and wait some more for it to clear. PayPal might take a small percentage out of every payment you receive, but it means clients can pay you as soon as they receive an invoice. Like taxes and other non-negotiable costs, be sure to factor this fee into your overall billing structure. Since most clients will only pay within 30 days of invoice date at the earliest, even if your invoice says “Payable on receipt,” consider budgeting to spend income 60 or more days after you expect a payment to arrive. That way, timely payments are a pleasant surprise and late ones are manageable. This doesn’t mean letting clients slide if their payments run later than promised — you would still chase down any slow payers — but it will help you manage expenses and income more effectively. You won’t be as dependent on the timely arrival of any one given payment, and you would head off panic caused by a late payment. Think about alternative income sources in case you unexpectedly need fast cash: things you can sell on eBay or Craigslist, a business-only credit card you could tap for a cash advance, family members you could ask for a loan, good enough credit to qualify for a bank loan. This isn’t something to do on a regular basis, of course, but worth keeping in mind should a crisis arise. Of course, one of the best ways to head off a financial crunch is to build up a steady stream of income. That takes focused, organized effort, including ongoing marketing. Even when you’re in midst of a major project, remember to look for and line up a new one to start as soon as you finish that one. Otherwise, you’ll have a huge gap between getting paid for that project and finding, completing, billing, and getting paid for a new one. You might end up having to juggle overlapping deadlines on occasion, but too much work is better than not enough. Aim for a balance between large and smaller projects. That should help ensure a constant flow of income, as well as a manageable level of work. Smaller projects might generate faster payments as well. Depending on the type of client you work with, you might be able to negotiate advance payments for some projects, followed by incremental payments as you make progress on a manuscript. This is more likely to be doable with individual clients, such as academics or independent authors, than with publishers and businesses – but it never hurts to try to set up such arrangements. If you never ask, you never receive. Join professional organizations that provide visibility through membership directories or listings, along with job services, to expand your chances of finding new clients and projects. Use those memberships to enhance your reputation among colleagues by offering advice and resources, answering questions, and otherwise being useful and helpful. That’s the kind of activity that also can lead to colleagues remembering and referring you for new work before you even have to ask. Establishing good relationships with regular or repeat clients can also come in handy if a crisis arises. Those are the clients you can contact about expediting a current invoice or even asking for an advance on an upcoming project payment. I’d only make that kind of request once, though. It can’t hurt to sign up with some of the online job services, but be aware that most of them don’t offer leads to work that pays very well. Some colleagues say these resources can offer ongoing and fast-turnaround projects, though, so they are worth considering as a backup to your regular business activities. The bottom line is to build up a regular flow of both projects and income so you never have to be the person who asks colleagues for help with finding $250 worth of work that will pay in a couple of days. Or has to ask family and friends for a loan. Or has to sell some blood to pay the phone bill. How have you coped with a financial crisis? Even better, how have you organized your business (and your life) to head off such events?